Ready To Floss Like A Boss? DAILY FLOSSING is a key part of our oral hygiene routine. Although brushing twice a day is a good start to keeping our smile clean, even the most talented tooth brusher can’t reach those hard-to-reach spaces between teeth! That’s where flossing comes in. Lowering your risk of tooth decay, cavities, and gum disease. Leaving breath smelling clean and fresh. Making your teeth look cleaner and whiter. Helping make your dental appointments more simple and more comfortable. 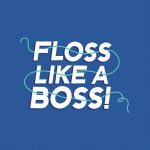 This month, we’re running our “Floss Like A Boss” campaign! Throughout the month, you can come into our office and pledge to take the Floss Challenge! By taking the challenge, you promise to floss every day for 30 days and by doing so, you are entered to win a prize at the end of the month. Step 1: Take a picture with a fun social sign and accept the 30-Day Floss Challenge. Step 2: Post the photo to Facebook as a public post and tag the location of our practice.